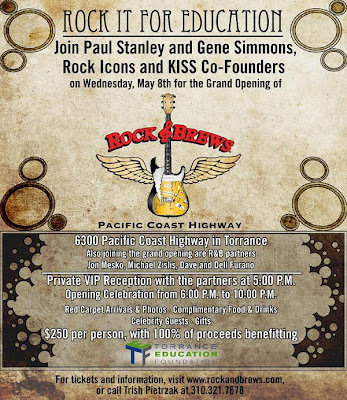 KISS members Paul Stanley and Gene Simmons will be on hand May 8 in Torrance, California to open the third restaurant in the expanding Rock & Brews chain. Located on the Pacific Coast Highway (PCH), the Torrance location is the newest in the Los Angeles area and the third to open in just over a year. The flagship location in El Segundo, CA. opened in April of 2012, and the first international location in Los Cabos, Mexico opened in March. Stanley and Simmons, along with their co-founding partners, restaurateur Michael Zislis and concert industry veterans Dave and Dell Furano, plan to open as many as 100 Rock & Brews restaurants in the next five years. Fans can join Stanley and Simmons on Wednesday, May 8th for the Grand Opening of Rock & Brews Pacific Coast Highway. 100% of the ticket sales for the event will benefit the Torrance Education Foundation, which promotes and supports academic excellence for pre-kindergarten through 12th grade students in the Torrance Unified School District. For details and to buy tickets, click here.